Posted on January 30, 2018 by Elina T.
Mid-November, an article was released on Pottermore titled “Everything we know about Fantastic Beasts: The Crimes of Grindelwald so far.” The article revealed a lot about what we could expect from the next film. Firstly, the film takes place in 1927, just a few months after the events that occurred in the first movie. It follows the story of Newt Scamander to Europe (specifically Paris and London), so we are traveling closer to Dumbledore’s home in Goodric’s Hollow and Hogwarts. Based on the title (The Crimes of Grindelwald), it may be assumed that this film will follow Grindelwald (played by Johnny Depp) and elaborate on his story. We know from the books that Grindelwald and Dumbledore have a history, and it appears as if it will be expanded upon in this movie. Based on the first Fantastic Beasts movie, it seems as if Dumbledore also had some sort of relationship with Newt Scamander (Eddie Redmayne), as we know he argued against his expulsion from Hogwarts. It is inevitable that Grindelwald will escape from MACUSA (the U.S.’s version of the Ministry of Magic). Looking back at the books, we know that Grindelwald’s rise was not unlike that of Voldemort. It was a dark time for muggles and wizards alike. Grindelwald’s intention was also aligned with Voldemort’s: they both believed that pure-bloods were superior, and that anyone who did not fit into this category did not deserve the right to use magic. We also know that Grindelwald is in possession of the Elder Wand (because of a picture of the cast that was released along with the article), which Dumbledore later acquires as he has it throughout the Harry Potter films. The picture also depicts the mysterious Leta Lestrange (Zoe Kravitz) mentioned in the previous film sitting with Theseus Scamander (Callum Turner) — Newt’s brother. Another important note — Credence (Ezra Miller) is alive! At the end of the first movie, it seemed as if he was killed after transforming into his Obscurus form. However, he appeared in the picture with everyone else, so he must’ve survived… right? Although we already know quite a bit about the movie, there are still bound to be surprises and plot twists. I’m extremely excited to see this movie, and am glad that the characters from the first movie will be returning, along with many new faces. 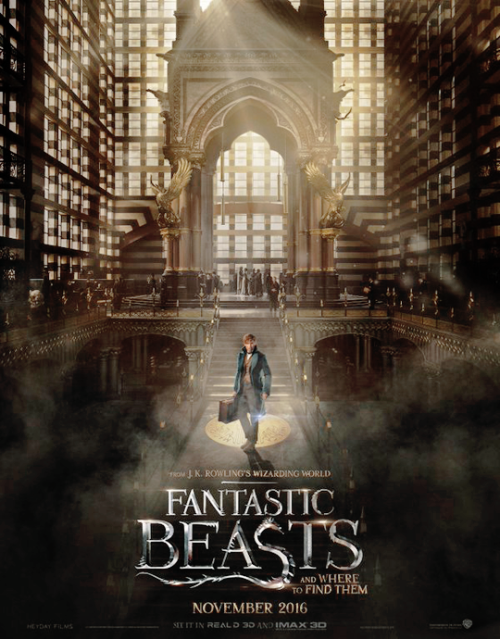 J. K. Rowling herself has written the screenplay, and David Yates is directing the film. It will be released in the U.S. on November 16th, 2018. I loved the first movie and I know I’ll love this one too! It’s really intriguing to hear everyone’s backstories and how it shaped them into who they are in the Harry Potter books and movies. I can’t wait for this movie!!! Posted on September 18, 2017 by Elina T.
I’m a huge Harry Potter fan, and I absolutely love Luna! She’s one of my favorite characters. I also really loved the movie Fantastic Beasts and Where to Find Them, so I decided to write out a scenario in which Luna and Rolf (Newt Scamander’s grandson) meet. They do actually meet and end up getting married, but this is an idea that I had of their first encounter. Luna crept forward, gently pushing away some leaves to reveal a young man dashing about. It appeared as if he was searching for a lost possession. “Come back here!” He moaned, poking half-heartedly at a knot in a rather gnarled-looking tree. He jumped backward immediately, gasping as a flock of birds flew angrily from a branch far above. Luna peered past the shrub she was crouched behind, watching the figure before her as he restlessly ran his hands through his wavy auburn hair. After a few more minutes of searching through the underbrush and surrounding trees, the man sat on the forest floor, and reached out to bring a case toward him. Luna squinted-she hadn’t noticed the case before. She watched curiously as the box rattled slightly, as if something was trying to get out. The man simply sighed, leaning forward, and resting his arms on his case. Suddenly, Luna felt something tugging at her patchwork bag. “Oh!” She exclaimed, immediately clapping a hand over her mouth. Her protuberant eyes widened as she watched the man look up, jump to his feet, and pull out his wand. Thinking quickly, she decided upon revealing herself. She stood up, pulling the squirming creature from her bag. The man stopped short at the sight of her, tilting his head to the side as if deciding whether or not to trust her. The man, who had crouched down and unlatched the case, paused, studying Luna’s face, his sage-green eyes narrowed and his brows furrowed. “Well, I did go to Hogwarts. I’ve been out for a few years though,” he said, remembering he still had the niffler in his hands, and gently placing him into the case. “Oh! I went to Hogwarts as well. I was in Ravenclaw,” Luna exclaimed. “Luna Lovegood,” she said, holding out her hand. “Likewise,” replied Luna. “Oh, watch out!” She crouched down, catching the little niffler who had made another wild attempt at escape. Rolf shook his head, his wavy hair dangling just above his eyes. “He’s always doing that,” he said, once again taking the niffler from Luna and putting him into the case. “Hold on,” said Luna, rummaging through her bag and fishing out a few golden galleons. “Here you go!” She held the shiny coins out to the niffler, who nimbly plucked them from her outstretched palm and retreated back into the case.